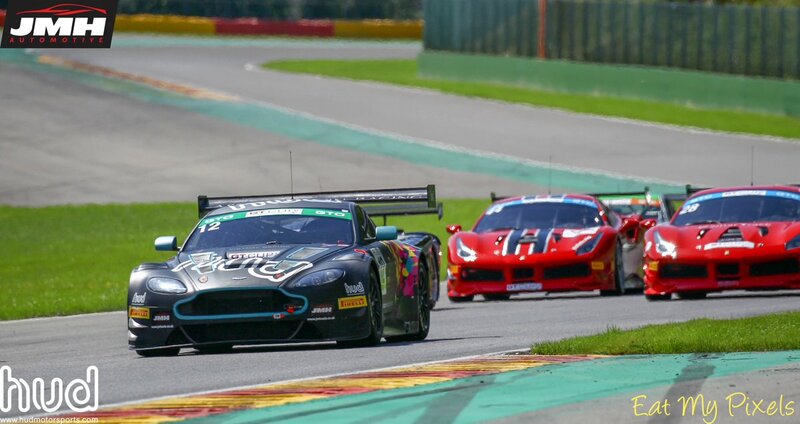 In the weekend of apparent Aston Martin misfortunate and incident, one shining exception to that was the JMH prepared Hud Motorsport Aston Martin Racing V12 Vantage GT3 of Nigel Hudson and Adam Wilcox after they battled and won at Spa Francorchamps in the third round of the Bute GT Cup Championship. Normally a three race meeting, the twenty four cars that made the journey over to Spa, Belgium would compete in two - fifty minute races, both with pit stops so that both Pro and Am drivers would get the full racing experience that the iconic circuit deserves. Infamous for having more seasons in one day than there are actual seasons, Spa didn't disappoint with a mixture of sun and torrential rain over Friday as the teams tested for the weekend's work ahead of them but fortunately that all settled down in time the two races held over Saturday and Sunday. Race 1 started like it would all be going wrong for the #12 car as Hudson was quickly pinged for an alleged jump start as the car ahead dropped away from the lead car just at at the green light but that drive through penalty just served to bring down the 'red mist' for him as he then went hammer and tongues before he handed over to Wilcox. “I thought it had a problem, so I went for it, but we got a penalty for jumping the start. Adam then did a great job, we overcame it, and won! I really enjoyed it” said Hudson after the race having taken the chequered flag by nearly twenty seconds. Slightly hampered by their elongated minimum pit stop time in race 2 after Saturdays race win Hudson and Wilcox went on to claim P2 in the weekends second race on Sunday which went somewhere to relieve the frustration of Brands (with that Audi). As a result of their achievements in Spa, the #12 Hud Motorsport car leads the GTO class and are currently third in the overall championship. 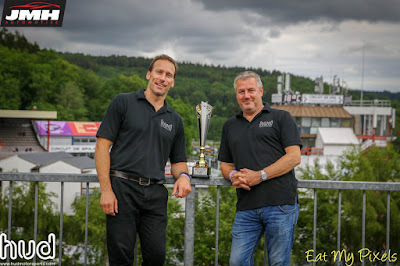 Despite having to swap chassis for both Brands Hatch and Spa due to damage, the Whitebridge AMR duo of Chris Murphy and Adam Hatfield lead the GTH class and are fourth in the overall championship. 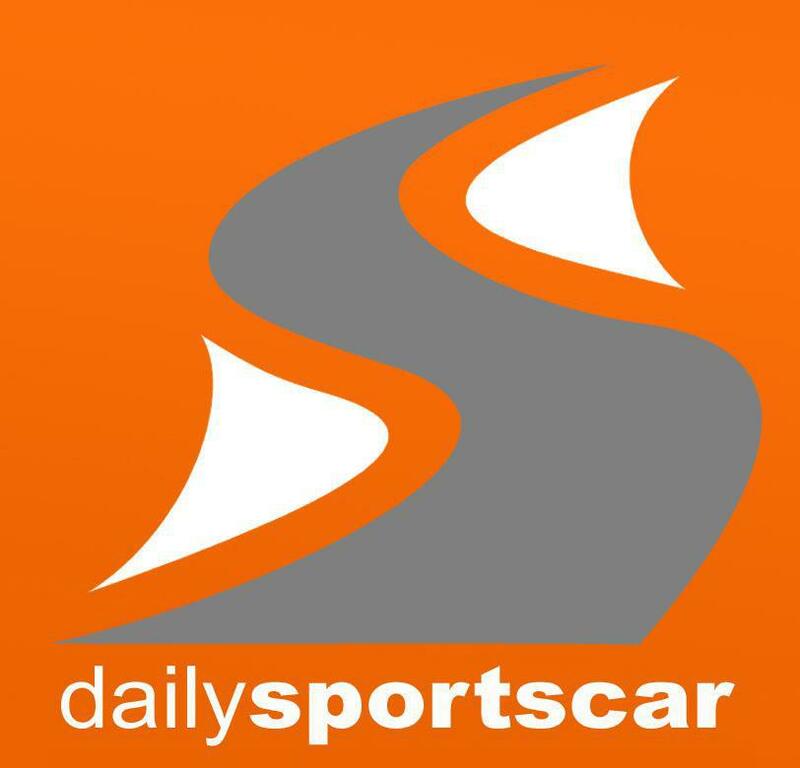 The fourth round of the championships moves over to Snetterton at the end of the month. 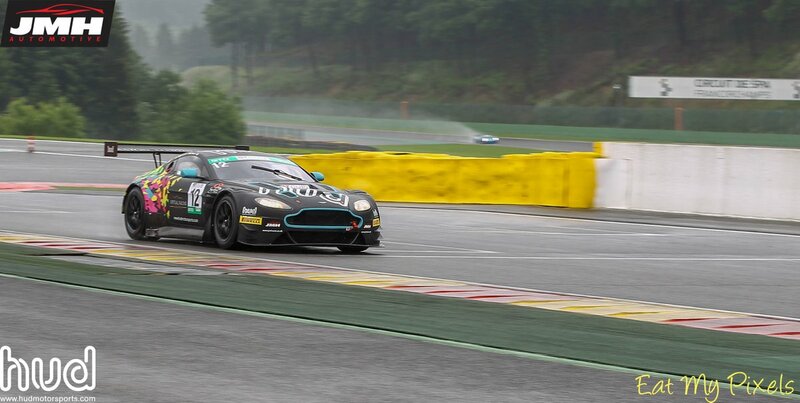 In the meantime the Whitebridge AMR team have a date at Le Mans and will then hopefully return with their V8 Vantage GT4.